The meat, baked the whole piece, replaces the sausage. Serve it sliced on a festive table, or prepare a sandwich for lunch to take to the road or at work. Cooking this meat will take a few hours, but the result will surprise you. Prepare an aromatic infusion. In 100 ml of water dissolve 1 teaspoon of salt and 0.5 teaspoon of ground black pepper. 1 head of garlic clear, skip through a garlic press and put it with salt and pepper. Leave the mixture for 60 minutes to infuse. Take a piece of the flesh of pork, beef or mutton weighing 2-3 kg. 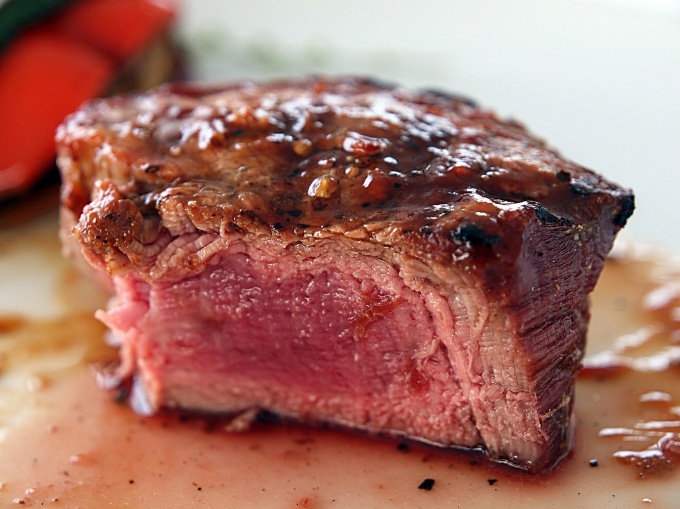 For the preparation of this dish beef is well suited tenderloin, sirloin, thin and thick edge. When buying pork, take the pork loin, bacon or ham. If you're going to bake the lamb, buy the ham, loin or renal part. Thoroughly rinse the meat under running cold water, dry on paper towel. Inject the most part aromatic infusion into the meat using a pastry syringe with a thick needle evenly around the piece. Lubricate the entire surface of the meat with the remaining infusion and place it on a baking sheet. Place pan with meat in oven preheated to 200 degrees. Bake it until Golden brown. Reduce oven temperature to 160 degrees. Continue to bake meat, is constantly pouring its separated juice. Meat is ready if when you puncture it with a knife the clear juice is flowing. Meat cooked a large piece on the side, serve fried or boiled potatoes, buckwheat, pasta or rice. You can prepare a pea puree. Separately serve marinated or pickled vegetables, sauerkraut, salad of fresh vegetables. If you don't have a whole piece of meat of the desired size, feed aromatic with a solution of a few small pieces, put them together and bake in the oven.